After completely re-designing the EL, Swarovski decided not to rest on their laurels, and just months later, released the new HD version of their old SLC binocular in Europe. Not as well known among birders, particularly in America, the old SLC was usually thought of as being more of a hunter’s binocular. SLC (which stands for “slim, light, compact”) binoculars comprise an extended product line, available in 8x and 10x56, 7x, 8x and 10x50, 8x and 10x42 and 8x30 models. 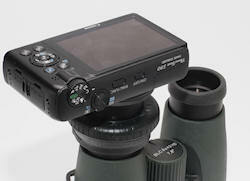 All SLC binoculars are single-hinge, roof prism designs. At this point, only the 42-mm models are offered with HD glass, and it is unclear how many, if any, of the other old SLC binoculars will be re-issued in HD versions. We received both the 8x42 and 10x42 HD SLC binoculars for review, and this article is only about those models. Upon first glance, the new SLC HDs look pretty much like the old SLCs, but there are major differences that emerge with a closer look. The old SLCs came in 7x42 and 10x42 versions while the new SLC HDs substituted an 8x for the 7x42 model. The new SLCs have slimmer ocular tubes and are slightly shorter. This, along with the use of magnesium chassis beneath the armoring, contributes to a real difference in weight: the new SLCs are 3-5 oz. lighter than the old ones. Swarovski also significantly upgraded the glass and coatings in the new SLCs, improving the optical performance across the board. The focusing system was redesigned, and the diopter adjustment mechanism was made intrinsic to the focus knob. The new SLC HD binoculars are very bright. They are made with the same fluoride-containing HD glass found in the EL Swarovisions. Due to the fact that the SLCs lack the field-flattening lenses of the ELs, the SLCs are actually a tiny bit brighter. This represents a substantial performance enhancement on what was already an excellent binocular. Optically, the new SLC HDs sit comfortably on a par with the very best binoculars available today from any manufacturer. The sharpness and contrast are truly excellent and the colors are vibrant and true. In terms of depth of field, we compared the SLC HD binoculars with the best we knew of in that regard, and we were pleasantly surprised to discover that they bested the performance of one of them and were equal to the other. Suffice it to say that the depth of field on the new SLCs is very impressive indeed. Another significant change to the 42-mm SLC HDs is in the ocular lens design. Swarovski literature speaks of the wide-angle eyepieces that yield a particularly wide field of view. The 8x SLC has a remarkable 408-foot field of view at 1000 yards, while the 10x model has a more pedestrian 330-foot field. That’s still above average for high-end binoculars, though not as strikingly so as the 8x. The SLCs have 18.5 and 16 mm of eye relief on 8x and 10x models respectively. That’s enough to be comfortable for most users but is slightly below average relative to other 42-mm binoculars of the corresponding magnifications. The new SLC HD binoculars feature the same advanced coatings found on the EL Swarovision binoculars. 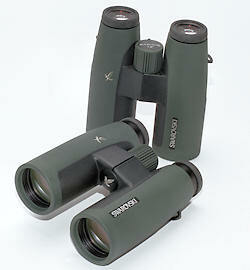 Swarovski SLC HD binoculars are fully multi-coated and phase-coated. The Swaroclean coating on the outside surfaces of the lenses makes water bead up and drop off more quickly. The same coating also tends to prevent dust or dirt particles from sticking, so it generally helps maintain a clearer cleaner view. The remaining three coatings are found on the lenses and prisms. The Swarobright coating improves color fidelity throughout the spectrum of visible light. The Swarodur and Swarotop coatings which maximize brightness and contrast. How all these coatings actually do what they do is probably too technical for this venue, but the key observation is that they really do work! Swarovski SLC binoculars are roof prism binoculars of a single-hinge design. They are about 6.25 inches long with the eyecups fully extended and almost exactly 5 inches across with the hinge at its widest setting. We weighed them in at 29.3 oz. and 28.1 oz. for the 8x42 and 10x42 models respectively.The tethered objective lens covers and rain guard add another 2.3 oz. of combined weight, which is relevant since most people will carry those into the field with the binocular. These weights are a bit high, relative to the general class of 42-mm roof prism binoculars, but there are other considerations. First, the SLCs are fully armored and have durable magnesium chassis – these are really solid and well-constructed, able to take a fair pounding in the field without any loss of function. Further, in the hands, they don’t feel as heavy as they actually are, largely due to the great balance of these binoculars. The SLCs fit the hands perfectly, almost asking you to use them. Nothing else, including their mass, crosses your mind. The interpupillary distance range of the new SLC binoculars is 56-74 mm. This means that these binoculars will comfortably fit most people unless they have an unusually wide or narrow face. And of course, these binoculars are fully sealed and nitrogen-purged to be dust-proof, internally fog-proof. We tested the SLC HD binoculars and found both to have a minimum focusing distance of 6 feet without appreciable field collapse. That is very good performance for 42-mm roof prisms in general, and achieving it without field collapse is even better. The new SLCs go from minimum close focus to infinity in 2 full turns of the focus knob. We wrote about this extensively in the EL Swarovision review (see here) and while the justification sounds pretty good, the bottom line is that this feature will frustrate some people. Yes, this mechanism confers great precision in focusing, but if the subject is on the wing (and birds have an annoying habit of flying…) it’s often too slow. The diopter adjustment is concealed under the focus knob. To adjust the diopter, focus the left ocular on something, and then without changing that focus, pull the knob up towards yourself until it clicks open. A scale of +/- 4 diopters relative to equal appears. Note, the “0” point is marked by a raised line on the hinge mount, and it is actually+ at about 9:30 – 10:00 rather than straight up (12:00). Frankly, they could have made that a bit more obvious, though it’s a trivial point. Adjust focus through the right ocular with the knob until it becomes sharp, and then close the mechanism by pushing the knob down. There are five click-stops within each diopter. The click stops help hold the knob position steady as you close the mechanism, but it still requires a light touch. The eyecups adjust with a helical twist mechanism: counter-clockwise moves the eyecups outward, clockwise adjusts them inward. There is a stable intermediate position between fully-in and fully-out. The mechanism has a “mushy” feel to it but the eyecups go into a sort of pseudo-lock if you keep twisting them when they are all the way out. The locked position is quite stable. The new 42-mm SLCs have a new capability relative to the previous models: you can digi-bin with them. Swarovski includes a digi-binning adaptor with each binocular that allows you to attach a point-and-shoot digital camera to your binocular. This turns the binocular into a telephoto lens for the camera (provided it has an extendable lens of suitably small diameter). Achieving truly artful photography with a digi-binning set-up is difficult at best – it takes a lot of practice. That being said, getting documentation quality photos with a digi-binning set-up is a very realistic goal, and this may be where the equipment really comes into its own. The objective lens caps are made of soft rubber with rings that fit around the barrels of the binocular. The caps dangle nicely and fit snugly yet easily over the rims of the barrels. The interesting thing is these caps actually have a hard insert for the section of the cap that covers the lens so that something impacting the center of the cap can’t push back onto the surface of the lens itself. Generally, these are great lens caps – functional and without significant drawbacks. The rainguard is the same as the one on the EL Swarovsions: a hard plastic unit that fits firmly on the rubber of the eyecups. The hinge adjusts through a series of micro click-stops, oddly enough, over a broader range than the binoculars themselves can achieve. The strap slips through a bracket on either side of rainguard. The neck strap is a composite of neoprene-like material stiched to leather and plastic hasps that attach to a thin cordura-type strap. The soft neoprene segment is molded to curve naturally around your neck. The length of the strap adjusts through a gear: pull a lever on the gear to release the strap for adjustment, and then snap the lever back to lock in the new position. It’s a very slick adjustment. Swarovski also markets their own harness called “Bino Suspenders”. While the strap is fine as it goes, we recommend using a harness on a binocular of this weight. The case is brand new, made of waterproof nylon like material and closed with a pair of zippers. The large compartment inside is divided by a stiff wall with the binocular clearly intended to fit behind that wall, and a pouch in front for things like a lens cloth, the digi-binning adaptor, a lens pen, a small notebook or whatever. 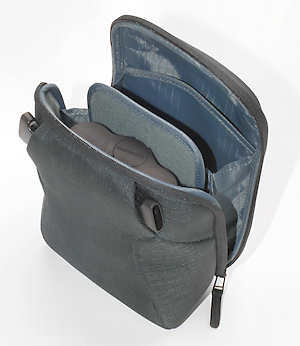 The dividing wall has its own expandable net pouch on the front side for storing small items. Swarovski includes a detachable strap for the case itself – after all, all those pockets mean nothing in the field if you don’t carry it in the field! 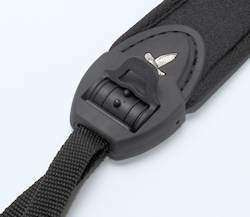 The strap is an adjustable 2-inch wide cord that attaches by means of a pair of double-toothed clasps for ease of use. This is a much better case than that originally shipped with the new EL Swarovision binoculars. Swarovski now ships this case with the Swarovisions too. Let’s see, what are we missing? Oh yeah – the price! The new SLCs cost $2,129.00 for the 8.x model and $2,239.00 for the 10x model. The new HD Swarovski SLC binoculars provide a huge jump in performance over the old ones, which is saying a lot since they were pretty darned good before. The addition of HD glass and use of the more advanced coatings puts this second line of Swarovski’s right into the top echelon of binoculars available today. The image is bright, razor sharp and has great depth of field. These binoculars feel great in the hand. What used to be primarily a hunter’s binocular is now a world-class nature-watching optic. The HD version of SLC binoculars have been discontinued. The new SLC binoculars have the same quality optics although the close focus is now 10.5ft. and they are slightly brighter because the close focus lens element was removed. Find them here: new Swarovski SLC.